These are the latest two volumes in Seren Books’ series reworking the medieval Welsh tales of the Mabinogion. I don’t really know those myths, but, luckily for me, there’s a handy synopsis at the back of each book that helped me get up to speed. However, when I read the synopsis in Gwyneth Lewis’s The Meat Tree (based on the fourth branch of the Mabinogion, the story of Blodeuwedd), I thought, how do you make a novel out of this, when it’s so disjointed by comparison? Well, Lewis tackles that issue head-on and has come up with a fascinating solution. 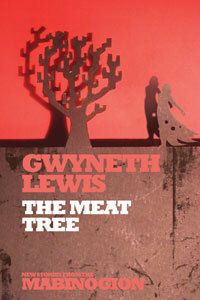 The Meat Tree is set in 2210 and focuses on Campion, an ‘Inspector of Wrecks’, and his apprentice Nona. They investigate a ship which has apparently come from Earth, though surely it’s too well-preserved, and there’s no sign of what happened to the crew. In the hope of gaining some clues, Campion and Nona turn to the virtual reality system placed prominently on the ship; this plunges them into the tale of Blodeuwedd – but what was its significance to the crew? Representing the myth as a VR game addresses its episodic nature, as the protagonists experience it episodically (‘the progression of the plot can feel very uncomfortable,’ says Campion [p. 37]). But, more significantly than this, it also puts a distance between the myth itself and our viewpoint characters, which allows Lewis to interrogate the myth as she goes, as well as retelling it. The text becomes something of a live laboratory, as Campion and Nona try to puzzle out what the story might have meant to the people who told it (both in their immediate fictional context and, by implication, to the original medieval tellers); they explore issues such as the symbolic representation of gender and power in a way that doesn’t feel at all forced. On a narrative level, though, The Meat Tree is also fascinating. The story is told entirely through the medium of Campion’s and Nona’s ‘synapse logs’ and ‘joint thought channel’, so that’s layer another of perception to add to all the rest. The protagonists’ identities shift and accrete (for example, near the beginning, we have Nona and Campion in the game playing male characters who have been turned into animals, one male and one female – and how well Lewis handles the writing of it), and even eventually bleed out of the game. There are also moments that bring the bare details of the myth sharply off the page, such as when Blodeuwydd (a woman created magically from flowers) realises that she is ‘a flower made of meat’ (p. 173). Towards the end of the novel, there is perhaps too much of a sense of the two protagonists slotting everything together conveniently – but, then again, what else was going to happen? It would be too much of a let-down if the mystery of the ship stayed a mystery, and there’s no one else to do the figuring-out. Whatever, The Meat Tree is a spectacular work of the imagination. The first and longer of Griffiths’ novellas, ‘Ronnie’s Dream’, is based on the Mabinogion story of Rhonabwy, whose dream was a vision of King Arthur and a vast gathering of knights. Griffiths’ Ronnie is a squaddie about to set off for Iraq; the leader he meets in his dream is not Arthur, but an analogue of Tony Blair. Reading ‘Ronnie’s Dream’, I felt the limitations of not having read the Mabinogion; a synopsis is fine, but it can’t give me the sense of the original tale. Griffiths’ version is a satire, primarily on the Iraq war, but it doesn’t quite work for me on that level. For one thing, it feels like a bit of a grab-bag – mostly stuff on the war, but it also squeezes in some swipes at celebrity culture and some social stereotypes – which dilutes the focus somewhat. For another, as targets of satire, these issues seem to me quite well-worn, and I’m not sure that this tale says much about them that is fresh. This is not to say, though, that ‘Ronnie’s Dream’ has no bite. Some aspects certainly have, such as the Blair-figure’s stock speech (‘By my actions have I answered questions. The time has come for an end to talking…’ [p. 68]), which is repeated until ground down into empty rhetoric. In addition, the contrast between the poetic style of Griffiths’ narration and the more modern, colloquial dialogue is very effective; and there’s general interest in seeing how the author adapts details of the myth for the present day. Something that both Griffiths and Lewis manage to do in their respective books is evoke a true sense of fantasy, the disquieting and disorienting sense that (at least within the pages of the book) the world is not as you thought. In doing so, they show just how much vitality these myths still have. This review (half of it, anyway!) is posted in support of ‘women and sf’ week at Torque Control. What a fantastic review David. I think this is a brilliant series and I can’t wait for the next pair in the series next year. This second pair were quite different from the first, both more challenging in style, but finding something special in the old stories. Thanks for the links. Thanks, Annabel! I haven’t read the first couple of books in the series, but these two have definitely got me interested. Did you know the original stories before reading these books? I did read the Mabinogion and several fantasy books based on it – but at least twenty years ago, so I’m rather keen to get my hands on the new OUP translation that the synopses in this series are based on to renew my acquaintance properly!